Did Abortion Pill Cause More Deaths? Two more women have died after using the abortion pill RU-486, federal health regulators said Friday, in warning doctors to watch for a rare but deadly infection implicated in earlier deaths. At least seven U.S. women have died after taking the pill, sold since 2000. The Food and Drug Administration cannot prove the drug was to blame in any of the cases. In a cluster of four cases in California, the women died from an infection of the bloodstream, or sepsis. Those women did not follow FDA-approved instructions for the pill-triggered abortion, which requires swallowing three tablets of one drug, followed by two of another two days later. Instead of swallowing the final two tablets, the second course of pills was inserted vaginally in the four women, a so-called "off-label" use of the drug that studies show works and is widely recommended by abortion clinics but does not have federal approval. The FDA has not confirmed the cause of the latest two deaths. But the symptoms appear to match those seen in the California cases, an FDA spokeswoman said. However, it was not immediately known if the second course of pills had been inserted vaginally in the two women, she added. The spokeswoman declined to be identified, saying she could not speak publicly about the issue. 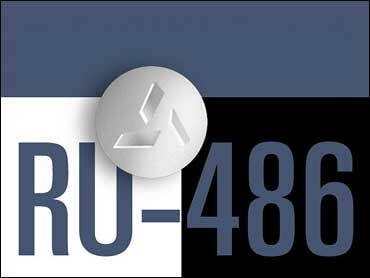 RU-486 is also called Mifeprex or mifepristone. It is sold by Danco Laboratories and is approved to terminate pregnancy up to 49 days after the beginning of the last menstrual cycle. It blocks a hormone required to sustain a pregnancy. When followed two days later by another medicine, misoprostol, to induce contractions, the pregnancy is terminated. The FDA previously has said the abortion pill remains safe enough to stay on the market. The rate of sepsis is about 1 in 100,000 uses, comparable to infection risks with surgical abortions and childbirth. The other U.S. death associated with Mifeprex was a case of a ruptured ectopic, or tubal, pregnancy in October 2001. The drug is not to be used by women with suspected or confirmed ectopic pregnancies, a life-threatening condition in which the fertilized egg has implanted outside the uterus. In the California cases, all four women tested positive for Clostridium sordellii, a common but rarely fatal bacterium. Neither of the two latest deaths was in California. Further details were not immediately available. Federal health officials plan a May 11 workshop to discuss emerging cases of disease involving the germ, which also have included infections in patients who have received skin grafts. A message seeking comment left with a Danco Laboratories spokeswoman was not immediately returned.